Combine buckwheat flour, all-purpose flour, salt, and baking powder in a large bowl. Add some of the melted butter, egg, and milk to the flour mixture. Stir well until a thick batter forms. Set aside. Chop dill finely. Peel and pit avocado. Quarter tomato and remove seeds. Finely dice tomatoes, avocado, and shallot. For the avocado-tomato tartare, place avocado and shallots in a bowl. Season to taste with chili flakes, salt, pepper, and some of the lemon juice. Add tomato cubes. Mix carefully until well combined. Set aside. For the cream cheese topping, whisk together cream cheese, dill and remaining lemon juice. Season with salt, and pepper to taste. Set aside. Brush a large, non-stick frying pan with some of the remaining melted butter over medium-low heat. Drop batter into the hot pan to form small rounds. Wait for approx. 2 – 3 min. until the sides set and small bubbles form on top of the blini rounds. Flip to cook for approx. 2 – 3 min. on the other side. Place on a serving plate. Garnish half of the blinis with a dollop of cream cheese. Divide salmon into bite-sized pieces. Place salmon on cream cheese and top with caviar. 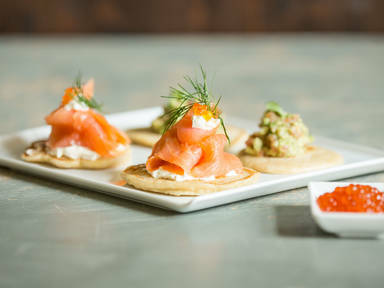 Place avocado-tomato tartare on the rest of blinis. Serve with more dill if desired. Enjoy as a starter, breakfast or snack.